2 Men Convicted In Canada In 2013 Train Derailment Plot : The Two-Way Raed Jaser and Chiheb Esseghaier were found guilty on terrorism-related charges for a plan to derail a passenger train traveling from New York to Toronto. 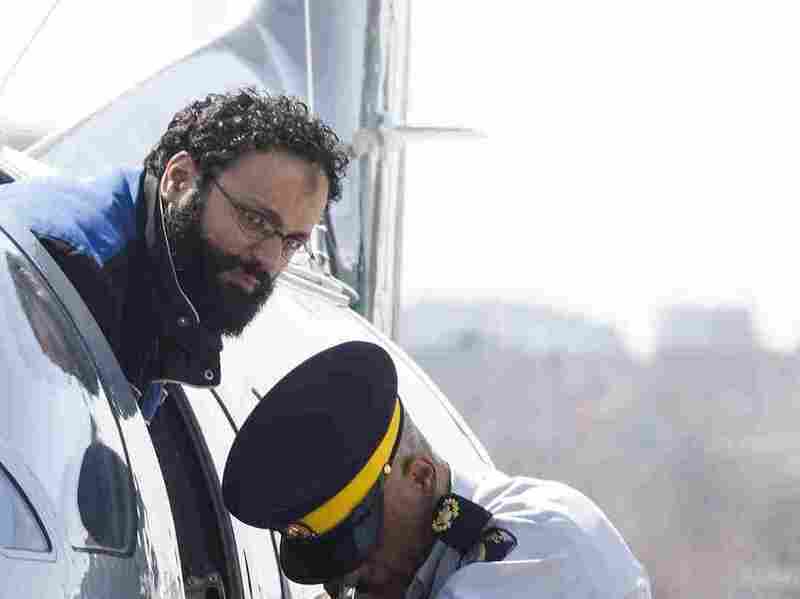 Chiheb Esseghaier, one of two men convicted of plotting a terror attack on passenger train, is led off a plane by an Royal Canadian Mounted Police officer in Toronto in 2013. Two men have been found guilty in a court in Canada on terrorism-related charges related to a foiled 2013 plot to derail a passenger train traveling from New York to Toronto. Raed Jaser, 37, who is of Palestinian descent and Tunisian-born Chiheb Esseghaier, 32, could spend the rest of their lives in prison for the plan, which prosecutors said was motivated by Islamic extremism and guided by members of al-Qaida. Jaser's lawyer had argued that his client was only pretending to be interested in the plot in order to extort money from Esseghaier and an undercover officer who was part of the sting. The convictions carry a maximum sentence of life in prison. The CBC reports: "Esseghaier was found guilty of all charges against him while Jaser was convicted on all but one charge. After 10 days of deliberation, the jury said it was "irrevocably deadlocked" on the charge against Jaser of "conspiring to interfere with transportation facilities for the benefit of a terrorist group." "Esseghaier appeared unruffled as the Toronto jury found him guilty on all five terrorism charges against him. He calmly repeated that he hadn't participated in the trial and didn't want to take part in sentencing arguments either. "Jaser looked at the ceiling at one point after the jury delivered their verdicts, finding him guilty of three out of the four charges he faced. He then kept his right hand up to his face through the rest of the proceeding, biting his knuckles at one point."